This bouquet may look soft and delicate but it can make a strong and lasting impression to your special someone! 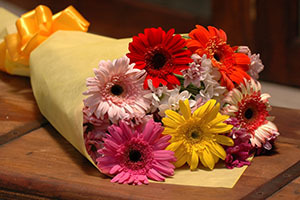 Surprise them with this beautiful mixture of Gerberas and Mums - it will surely do the trick! This flower combination is believed to bring happiness and laughter to the home. The mixture of the bouquet means compassion, cheerfulness, rest, loveliness, optimism, abundance, wealth, friendship and secret love. Please take note that colors of the Gerberas and Chrysanthemums may vary depending on availablity.